Hello DYSU Fan! Welcome back for a another round of challenge. This one is near and dear to the team's heart, because we know we don't have enough opportunities to express to friends & family how lucky we are to have them. So this week we're challenging you to make something For a Friend. I made it to match the tea set I made last week for a friend. I hop you like it!! This is delightful Joan - love those stacked tea cups. So pretty. Beautiful creation Joan.. I love teacups images. Great JOB! Fabulous card - very cool image. Being a huge tea drinker, you KNOW I love these cups and that 3D project from earlier! PS your twine will go in the mail in the next day or so. Wound into (3) rolls of 20 yards each so you can share it further, if you want to part with any! LOL! 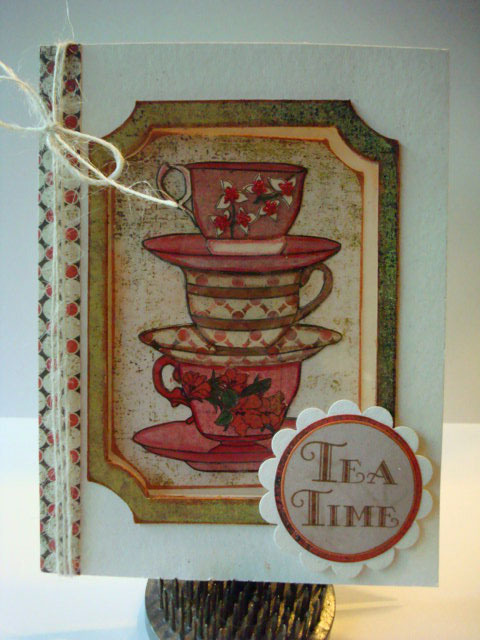 Your stacked tea cups are fabulous...I hope you'll link up again this week at 52 Card Pickup! This is exactly the card I imagined when I drew these Teacups! Wonderful wonderful Card! Thank you for showing my image so well! Those stacked tea cups are beautiful! I love the vintage colors and it fits perfectly to the gift set for your friend! Love the teacups - I hope you'll link up at 52 Card Pickup again this week!